The App Bank with Friends which let you hook up with friends for date or something more promising privately and in a secure way was removed from Apple Store three months back for violating the Apple's strict policies. The company has come back with a new name 'Down' however the modus operandi remains the same. You install the App and click a button 'I'm down' and it will pair you with all other people who are willing to go down with you. The App is still named as Bang With Friends on Google Play and has had been successful on Facebook as well as on Android in bringing friends who are willing to 'bang' together. The App may touch a hint of unwanted territory but as long as you are sure about yourself it doesnt matter. The latest App however tries to broaden its horizons by accommodating general dating instead of being just a hook up App. 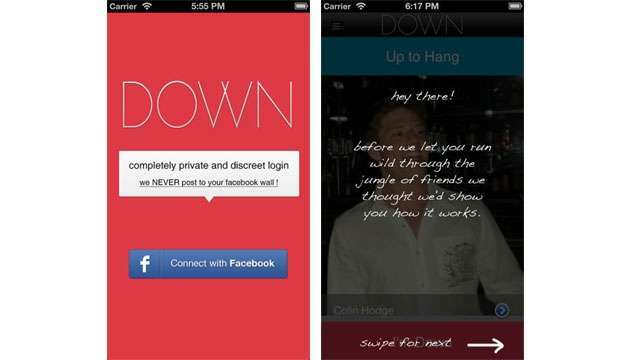 It also has added a new button "Down to hang" clicking which will just let you chat or chill with your Facebook friends. To download the Down for iOS please visit Apple Store. Android owners if interested can download this App in its original form from Google Play here.